Longview, Washington is located on the northern bank of the Columbia River, 90 miles inland from the Pacific Ocean (City of Longview). The city currently has faced three proposed fossil fuel terminals in its port: the Millennium Coal Refinery, Riverside Oil Refinery, and Washington Energy Propane Storage and Transfer. This webpage will provide a historical overview of Longview, as well as the details of each of these three proposed projects, and the related environmental risks they have posed. Longview’s location is eye-catching to industrial companies because it has a deep water port and excellent rail access. Longview is in the historic homeland of the Cowlitz Tribe. The first pioneers settled in 1849 in the area along the Cowlitz River (City of Longview). Uniquely, the entire city was planned out before construction started, and was the only U.S. city at the time to have been built with private funds. Longview was founded by the President of Long-Bell Lumber, Robert Alexander Long, and was transformed into a booming timber community (Frost). The Long-Bell Lumber Company was the center of industry with two mills in operation, employing nearly 14,000 workers (City of Longview). Long-Bell used the quick clear-cutting technique that ultimately devastated the surrounding forests. Although the timber industry has subsided in the last twenty years, it is still an integral part of the economy. Longview Timber LLC was opened in 2007, and just recently was bought by timber giant, Weyerhaeuser, in July 2013. Currently, Longview’s arts and education departments have flourished, becoming integral pieces of the city’s economy. The Lower Columbia College now offers undergraduate degrees, which will help retain students in the area (Frost). The city government of Longview asserts that it has a diverse, stable economy and is projected to have a prosperous future ahead. Longview currently has fossil fuel industries, such as the north/south I-5 Pipeline that Williams owns, and a smaller pipeline traveling through Cowlitz County called the KB Pipeline. Longview currently faces three fossil fuel terminal proposals, each with enormous potential to shape the town’s economic and environmental future- either with slow ecological degradation or spontaneous catastrophe. 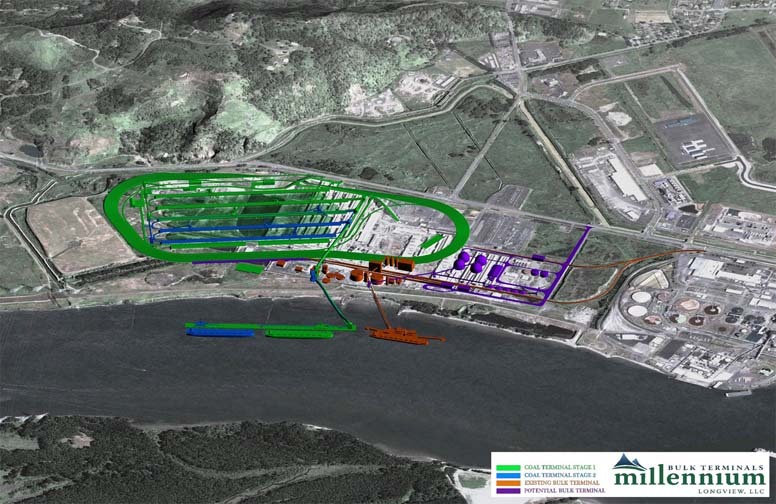 Millennium Bulk Coalproposed to renovate the old Reynolds Aluminum smelter facility located on the Cowlitz River, to turn it into a coal refinery and export terminal (Washington Department of Ecology). The Millennium Bulk Coal refinery was estimated to cost at least $800 million (Sightline Institute). Millennium promises to create 130 full time jobs, as well as thousands of construction jobs during renovation (De Place). The project is currently in the environmental review phase, and is facing push-back from the community. Millennium Bulk’s coal terminal would transfer more than 40 million tons of coal by train from the Powder River Coal Basin in Montana onto ships on the Columbia River at Longview’s ports, blocking traffic and congesting the city (See Powder River Coal Basin; Coal Trains). Gary Lindstrom, a Longview maritime consultant stated, “The amount of traffic created by the coal trains necessary for this proposal poses a serious threat to our economy…. Our rail infrastructure is not capable of handling these coal trains without causing traffic jam on a daily basis” (Washington Department of Ecology). Map showing the production and movement of crude oil in and out of Washington State (Credit: Washington Department of Ecology). Washington State has one the highest rates of asthma in the country, and Cowlitz County exceeds the state's average rate (Grothjan). Coal dust exacerbates asthma and chronic obstructive pulmonary disease, as the dust can blow up to 7 miles away (Grothjan). Stan Friedberg, a member of Physicians for Social Responsibility who specializes in toxic effects of carbon pollution, said, “Toxins from coal dust could increase inflammation and increase likelihood of heart attacks.” Susan Katz, chair of Environmental Health Work Group in Oregon, said, “Toxic chemicals found in diesel exhaust are linked to neurodevelopmental disorders, such as poor memory, autism and decreased intellectual functioning, and they are not measured by environmental agencies” (Grothjan). Both an oil refinery and separate oil-by-rail transfer terminal have been proposed by Riverside Refinery. A draft agreement, project summary, maps and other documents have been received for the oil transfer terminal that could handle roughly about 164,000 barrels of crude in a day (Columbian). The crude oil would be supplied by the Bakken Oil Shale Basin in North Dakota (See Bakken Oil Shale Basin). The terminal and refinery could exist side by side of one another. An estimated 72,500 barrels of liquefied petroleum gases, or LPG, per day would be handled at this facility (Columbian). Fossil fuel industries would have at least a temporary economic benefit for the Longview community through the creation of jobs, although there is considerable environmental risk that comes with refining and transporting coal and oil. Coal trains are uncovered and spew toxic dust into the air that accumulates in the environment; an oil spill would devastate the Columbia River ecosystem and decimate the fishery. There has been at least ten oil train fires in the U.S. between 2014 and 2015, and the oil trains would be hauling oil right through town (De Place). Shawn Higgins, a resident of Longview stated, “We can find another way to get jobs here, we don’t need to ruin 20 years of progress” (Grothjan). In 2016, the Port of Longview rejected the proposed propane terminal and an oil refinery (Cronin). Arch Coal also dropped the proposed coal terminal (Williams-Derry). City of Longview. (n.d.) My Longview. The City of Longview, Washington. Columbian. (2015). Port of Longview may be looking at oil-by-rail terminal. The Columbian. De Place, E. (Oct. 1, 2015). The Proposed Longview Refinery: Understanding the Basics. Sightline Institute. Frost, A. (2013, September 20). Our Town: Longview. Oregon Public Broadcasting. Grothjan, S. (2015). Wednesday forum focused on health risks of oil, coal. The Daily News. Washington Department of Ecology. (n.d). 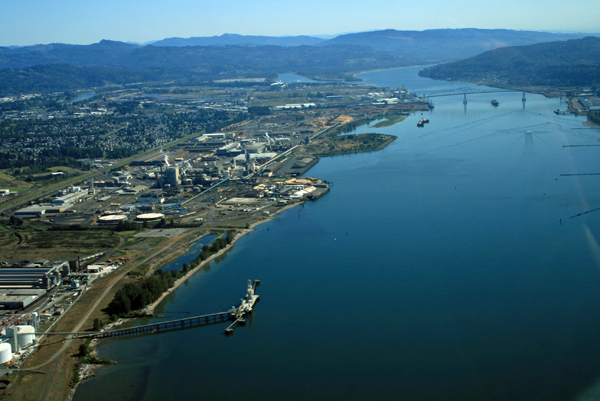 Environmental Review: Millennium Bulk Terminals Longview (MBTL) proposal. Washington Department of Ecology. Williams-Derry, C. (2016, May 27). Arch Coal Backs Out of Longview Coal Terminal. Sightline Institite.